Ranma Saotome never thought a martial arts training mission to China would turn out like this! 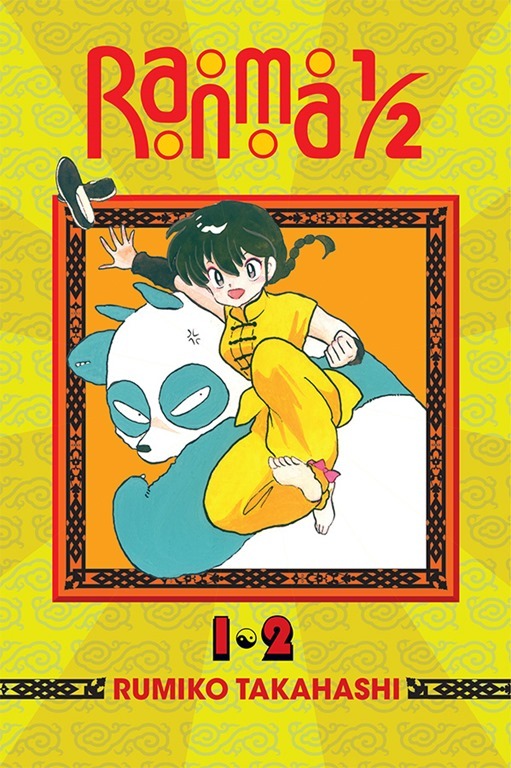 Due to an unfortunate accident at the cursed Chinese training ground Jusenkyo, when Ranma and his father get splashed with cold water, papa turns into a giant panda and male Ranma becomes a buxom young woman! Hot water reverses the effect, but only until the next time! Constantly chased by battle-happy martial artists and lovesick suitors of both sexes, what’s a half-boy, half-girl martial artist to do? The spotlight on Rumiko Takahashi’s career began in 1978 when she won an honorable mention in Shogakukan’s prestigious New Comic Artist Contest for Those Selfish Aliens. Later that same year, her boy-meets-alien comedy series, Urusei Yatsura, was serialized in Weekly Shonen Sunday. This phenomenally successful manga series was adapted into anime format and spawned a TV series and half a dozen theatrical-release movies, all incredibly popular in their own right. Takahashi followed up the success of her debut series with one blockbuster hit after another— Maison Ikkoku ran from 1980 to 1987, Ranma 1/2 from 1987 to 1996, and Inuyasha from 1996 to 2008. Other notable works include Mermaid Saga, Rumic Theater, One-Pound Gospel, and RIN-NE (all also published in North America by VIZ Media). Takahashi won the Shogakukan Manga Award twice in her career, once for Urusei Yatsura in 1981 and the second time for Inuyasha in 2002. A majority of the Takahashi canon has been adapted into other media such as anime, live-action TV series, and film. Takahashi’s manga, as well as the other formats her work has been adapted into, have continued to delight generations of fans around the world. Distinguished by her wonderfully endearing characters, Takahashi’s work adeptly incorporates a wide variety of elements such as comedy, romance, fantasy, and martial arts. While her series are difficult to pin down into one simple genre, the signature style she has created has come to be known as the "Rumic World." Rumiko Takahashi is an artist who truly represents the very best from the world of manga. Headquartered in San Francisco, California, VIZ Media distributes, markets and licenses the best anime and manga titles direct from Japan. Owned by three of Japan’s largest manga and animation companies, Shueisha Inc., Shogakukan Inc., and Shogakukan-Shueisha Productions, Co., Ltd., VIZ Media has the most extensive library of anime and manga for English speaking audiences in North America, the United Kingdom, Ireland and South Africa. With its popular digital manga anthology WEEKLY SHONEN JUMP and blockbuster properties like NARUTO, BLEACH and INUYASHA, VIZ Media offers cutting-edge action, romance and family friendly properties for anime, manga, science fiction and fantasy fans of all ages. VIZ Media properties are available as graphic novels, DVDs, animated television series, feature films, downloadable and streaming video and a variety of consumer products. Previous PostVideo Clips: Season 2 of The Americans–Teaser and Sneak Peek!Next PostTrue Detective – After You’ve Gone: Ramping Up The Tension!